where θ is the angle in radians. The small angle approximation is useful in many areas of engineering and physics, including mechanics, electromagnetics, optics (where it forms the basis of the paraxial approximation), cartography, astronomy, computer science, and so on. The accuracy of the approximations can be seen below in Figure 1 and Figure 2. As the angle approaches zero, it is clear that the gap between the approximation and the original function quickly vanishes. Figure 1. 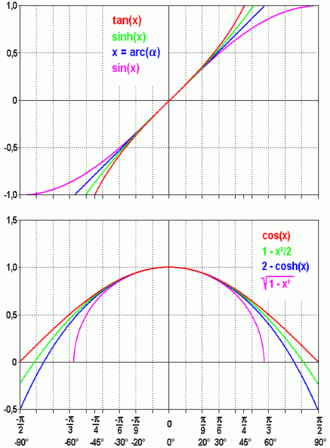 A comparison of the basic odd trigonometric functions to θ. It is seen that as the angle approaches 0 the approximations become better. Figure 2. A comparison of cos θ to 1 − θ2/2. It is seen that as the angle approaches 0 the approximation becomes better. The red section on the right, d, is the difference between the lengths of the hypotenuse, H, and the adjacent side, A. As is shown, H and A are almost the same length, meaning cos θ is close to 1 and θ2/2 helps trim the red away. The small-angle approximation for the sine function. Figure 3. A graph of the relative errors for the small angle approximations. tan θ ≈ θ at about 0.176 radians (10°). sin θ ≈ θ at about 0.244 radians (14°). cos θ ≈ 1 − θ2/2 at about 0.664 radians (38°). sin(α - β) ≈ sin(α) - βcos(α). where X is measured in arcseconds. The number 7005206265000000000♠206265 is approximately equal to the number of arcseconds in a circle (7006129600000000000♠1296000), divided by 2π. and the above approximation follows when tan X is replaced by X. The second-order cosine approximation is especially useful in calculating the potential energy of a pendulum, which can then be applied with a Lagrangian to find the indirect (energy) equation of motion. When calculating the period of a simple pendulum, the small-angle approximation for sine is used to allow the resulting differential equation to be solved easily by comparison with the differential equation describing simple harmonic motion. The small-angle approximation also appears in structural mechanics, especially in stability and bifurcation analyses (mainly of axially-loaded columns ready to undergo buckling). This leads to significant simplifications, though at a cost in accuracy and insight into the true behavior. The 1 in 60 rule used in air navigation has its basis in the small-angle approximation, plus the fact that one radian is approximately 60 degrees. ^ Holbrow, Charles H.; et al. (2010), Modern Introductory Physics (2nd ed. ), Springer Science & Business Media, pp. 30–32, ISBN 0387790799. ^ Plesha, Michael; et al. (2012), Engineering Mechanics: Statics and Dynamics (2nd ed. ), McGraw-Hill Higher Education, p. 12, ISBN 0077570618. ^ Larson, Ron; et al. (2006), Calculus of a Single Variable: Early Transcendental Functions (4th ed. ), Cengage Learning, p. 85, ISBN 0618606254. ^ Boas, Mary L. (2006). Mathematical Methods in the Physical Sciences. Wiley. p. 26. ISBN 978-0-471-19826-0. ^ Green, Robin M. (1985), Spherical Astronomy, Cambridge University Press, p. 19, ISBN 0521317797. This page was last edited on 20 April 2019, at 04:22 (UTC).